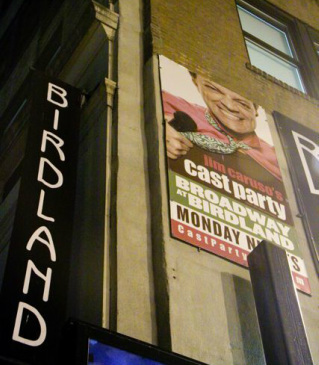 Cast Party is a wildly popular happening that has brought Broadway glitz and urbane wit to the legendary Birdland in New York City every Monday night since 2003. It is the ultimate spot to mix and mingle with show folk and the people who love them. Cast Party is a hilariously impromptu open mic/variety show where showbiz superstars and up-and-comers deliver jaw-dropping musical performances and razzle-dazzle. Legendary showman Jim Caruso guides the entire affair with razor-sharp humor and the unbridled enthusiasm of an uber-fan. Musical Director Billy Stritch holds court at the ivories, along with Steve Doyle on bass, and Daniel Glass on drums...but the real fun starts when the audience participates in the onstage festivities. Broadway legends, jazzers, cabaret divas, starry-eyed tourists and kids right off the bus take to the stage and entertain each other. If you have a voice, a dream and some sheet music, your Cast Party moment awaits.